Saddled with a small bathroom? Here are 5 ideas for enhancing your space—without the cost of remodeling. The bathroom is often the hardest and most expensive room to remodel. Plumbing lines are set so the location of the tub, toilet and sink are fixed. And if the original footprint is small to begin with, there is little that you can do to expand the boundaries without costly renovation. 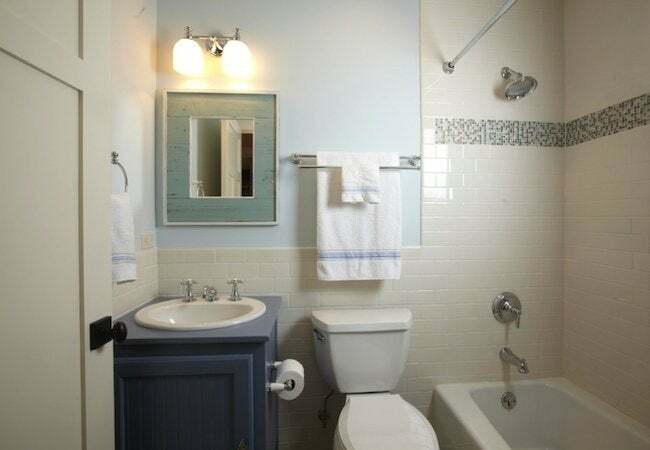 But even if your bathroom is small, there are easy ways to make it appear larger. Here are five “space-busters” that could help make your small bath big. If you have a vanity cabinet, consider replacing it with a pedestal sink. Although it will reduce your bathroom’s storage potential, the open area will make the room appear more spacious. If you can’t part with vanity storage, consider an open console design with shelves. Even a vanity cabinet raised off the floor with legs will make the room seem less confined. Shower curtains tend to make bathrooms look smaller, particularly if they are fabric or patterned. Consider installing glass shower doors. They will keep the view open and light and make showering less claustrophobic. There are many designs to choose from and, if you are moderately handy, relatively easy to install. Baskets, bins, and shelves can do a great deal to keep a small bath well-organized and looking good. Consider any and all options for wall-mounted and built-in storage. If your bath shares a wall with another room’s closet, see if it would be worthwhile to open the wall to capture some space for built-in storage. If not, there’s always the vertical wall space behind the toilet for a low-cost, ready-to-assemble shelf unit. We all know that a simple coat of paint can transform any room, and the bathroom is certainly no exception. If yours lacks natural daylight, you might want to consider lighter, more neutral colors. But don’t overlook darker and unexpected hues. A lively color will make everything appear different and even more spacious. If you have a dated bathroom, chances are you have outdated light fixtures. There are so many options for good bathroom lighting that even a modest investment will be worth the cost. Consider sconces on either side of a mirror or vanity for more evenly distributed, consistent light. Or if you have a single fixture positioned above the mirror, replace it with one that illuminates with a more decorative look.